Why are those labels on there? Because somewhere, sometime, someone did exactly what they’re warning you not to do! And that’s why I wrote this article. What do the markings in the photo at right mean and what would make two very highly experienced commercial pilots, on two separate occasions, think it was okay to walk across them without asking permission or even talking to anyone? That’s exactly what happened, not once, but twice within three weeks! Obviously, the FAA is not amused. For you non-pilots, those two yellow line are commonly known (or should be) among pilots and others who work around airports as a “Movement Area Marking,” and it marks the boundary of an area under the jurisdiction of an air traffic control tower. 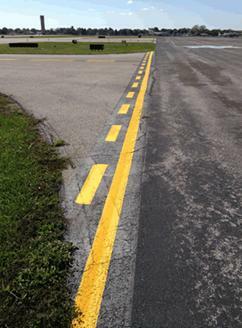 It is a violation of Federal Aviation Regulations to cross the marking from the side with the solid line (right to left in the photo) without first receiving permission from an air traffic controller (i.e., Ground Control.) The requirement to stop, and go no further, applies to aircraft, vehicles, and pedestrians--no one is exempt! Typically, an airport’s movement area begin at the edge of aircraft parking ramps, at the entrance to the taxiways and usually includes all areas beyond the boundaries of the aircraft parking ramps, including areas that are not paved. All ramp/taxiway boundaries are marked by Movement Area Markings. If you have a need to cross those markings into the aircraft movement area in an aircraft, an “authorized” vehicle or on foot, you must first contact Ground Control. If you want to walk beyond the Movement Area Marking because something fell off your aircraft or you just feel like taking a stroll, contact airport management; they are familiar with any special procedures for a given airport, and are usually happy to help. As a last resort, you can call the control tower directly and talk to the controller, but DO NOT CROSS BOUNDARY MARKINGS WITHOUT PERMISSION! Some of you may be wondering what might happen if you enter the movement area without permission. The obvious answer is that you, or someone else, might get killed! However, in the case of both recent violations, the Commercial/Instructor Pilot was careful to look around for other aircraft in the area and for aircraft approaching the runway from above to ensure that it was “safe” to enter the area before doing so. Unfortunately, being “safe” is not always the same thing as being "legal." So what happens? First the FAA controller is going to call airport management (or another agent with authority to move around the airport, such as on-duty firefighters) to go out and find those intruding individuals. Meanwhile, the controller begins writing the “Vehicle/Pedestrian Deviation Report.” It’s a mandatory incident report that makes its way to FAA Headquarters in Washington, D.C. within 24 hours. It doesn't matter if no aircraft were operating within 100 miles of the airport, it’s still a violation that must and will be reported. I’m going to contact you, ask you what happened, and then I’m going to fill out a report to send back to FAA Regional Headquarters. And then I have to decide what I’m going to do with you. For starters, I’m going to chew on you for a while and require you to take our drivers’ test again. If a vehicle was involved, I’m going to suspend your vehicle gate access card for at least 30 days, or more. In the past, two violators who were employed by airport businesses lost their jobs because of similar violations. So, nothing good is going to happen to you. Next, probably in a few weeks, someone from the St. Louis Flight Standards District Office is going to call you. Depending on the severity of the incident and their opinion of your “safety attitude,” you may face suspension of your pilot’s license, be required to obtain additional ground or flight instruction, or an FAA Check Airman might want to fly with you. What about the NASA “get-out-of-jail-free” report? Go ahead and fill it out, but it does NOT provide immunity from punishment if the FAA finds that you did indeed violate regulations. Please share this message with your friends, fellow pilots, and others in the flying community. Knowledge of these procedures will save you (and me) a lot of time and trouble, and it just might save your life. Fly Smart--Fly Safe! Bob McDaniel is Director of the Saint Louis Downtown Airport (KCPS). This article was originally published in the STL Downtown Airport Newsletter and is posted here with permission.